The key to great humor is surprise, and 100 GHOSTS: A GALLERY OF HARMLESS HAUNTS is a fun little hardback that satisfies with plenty of clever visuals. While today’s movies and TV shows are jam-packed with enough frights to keep you changing your shorts for a month, this book opens with an introduction to some not-so-scary ghosts. If they go ‘bump’ in the night, it’s probably because they stubbed a ghostly toe. Each long-gone soul receives a graphic and title, from the expected moniker of a classic haunt to the whimsical ghost who just can’t give up performance art. I chuckled often while flipping through the book, a rare occurrence for me when it comes to humor. As a humor writer, I’m used to dissecting comedy and studying it, but 100 GHOSTS allowed me to just sit back and enjoy the show. I still can’t decide on my favorites. I relate to Shy Ghost, but my geeky side adores the Fantastic Four Ghosts, R2D2 Ghost and Giant Robot Ghost. In all honesty, though, I’m cursed with The Bad Chinese Food You Ate Before Bed Ghost. I love this book, and I can see it being perfect for kids who are afraid of ghosts or what’s under their bed; they could make up stories about each ghost and use the book to defeat their fears. Heck, that's probably how I'll use it myself from now on. It would also make a fun gift for anyone interested in the paranormal. It’s a quick read, so if you’re stuck in the van during a ghost hunt, take this with you. Hopefully you won’t spot Up In Your Grill Ghost when you look outside. 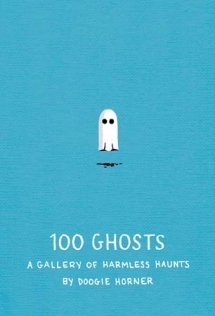 100 GHOSTS: A GALLERY OF HARMLESS HAUNTS is written by Doogie Horner (yes, I want to say Howser, too, I bet he gets that a lot) and published by Quirk Books.The book will be released on September 10. Pre-order it now, and spend some time perusing Horner's comedy at his website. I love plunging into the latest books, but sometimes you can’t beat antique reads. Having a Kindle means I can shop through the ages at Project Gutenberg or Feedbooks’ public domain pages for hours and load down my imaginary shopping cart with free books from generations past. Most people travel the broad highway of public domain for the classics like Austen or Shakespeare, but I highly recommend going off-road for a little adventure. 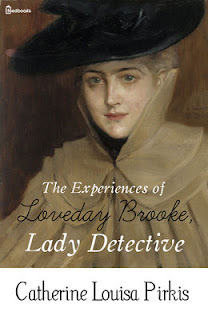 I’m always on the lookout for surprises, and my latest squee-gem is THE EXPERIENCES OF LOVEDAY BROOKE, LADY DETECTIVE by Catherine Louisa Pirkis. Published in 1893, this set of short stories follows the Sherlock Holmes method of mentally working out the mysteries, and is one of the few (for its time) featuring a female detective. The stories are enjoyable and easy to follow, considering that many of the clues relate to the time period. She's a brainy badass, and I love her for it. For a brief read before bedtime, I definitely recommend it. I’m brushing up on Robert Benchley these days, and I find him just as essential as P.G. Wodehouse or Terry Pratchett for a humor-writing education. You can score OF ALL THINGS and LOVE CONQUERS ALL for free on Amazon. The 1920s-era language may be more subtle than you’re used to for humor, but the topics are remarkably fresh. His struggles to catch the attention of a soda jerk behind the counter ring true with anyone who’s waited in line at Starbucks, and an essay discussing when letter-writing was a youthful fad will instantly make you think of today's social media, especially the fictional letter of a young lady scribbling madly while she's hauled off by a band of cutthroats. "Not three feet away from me is the odious person before described," his fictional Clarissa says, "Now he is threatening me with renewed vigor!" Hello, Twitter. The last book on today’s list is a bit of a cheat, since it’s by H.G. Wells, but the title alone makes it worthwhile. LITTLE WARS: A GAME FOR BOYS FROM TWELVE YEARS OF AGE TO ONE HUNDRED AND FIFTY AND FOR THAT MORE INTELLIGENT SORT OF GIRL WHO LIKES BOYS’ GAMES AND BOOKS is basically a D&D guidebook for its time, covering tabletop (and larger staged) military gaming. This caught my eye because of the title, and not because it’s too long to tweet. Amid today’s ongoing discussion about girl geeks and gamers, here’s one of the masters of science fiction stating 100 years ago that not only are there girl gamers, they’re smart, too. The book has illustrations, and it’s a nice slice of history for any gamer who’s battled their friends with maps and pewter figures. So hey, Felicia Day? H.G. Wells has your back. Next up on my wayback reading list: a selection of cheesy, weird and gripping science fiction! Set your phasers to "Whaaa?"